You can find more information about the MVC pattern on the CakePHP Book site. Personally, the reason why I prefer CakePHP over other PHP frameworks is its better support for console applications. CakePHP has a powerful console tool that can be customized to build applications for both the web and the console world. I’ll do so by recreating the example that Stephen Thorpe presented in his article Untangling MVC with CodeIgniter using these two features of CakePHP. Thorpe’s example application presents a form to collect an email address, validates the address, stores it to a database. Before you start to write any code, you’ll need to download and install the latest version of CakePHP from the CakePHP website. Make sure that your web server supports URL rewriting (Apache does so through mod_rewrite for example) as it is heavily used by CakePHP. There are other fallback methods, but they are outside the scope of this article. Uncompress the archive file in the document root of your web server and rename the directory to Subscribers. Make the directory Subscribers/app/tmp writable to the user account under which the web server runs. Open your browser and navigate to the Subscribers directory (for example http://localhost/Subscribers/). The philosophy of CakePHP is “convention over configuration.” If you follow CakePHP’s basic naming conventions for classes, variables, file names, and paths, you can minimize your configuration files to essential information. The directory app/Config is one of CakePHP’s conventions. In this directory you’ll find the default configuration files and can add your specific files as necessary. CakePHP provides some basic settings inside the core.php file, and you can override these setting by editing the bootstrap.php file which is intended to be specific for your application. CakePHP also provides a sample file for database configuration called database.php.default. In the initial browser output you should see two red notices asking you to edit the parameters Security.salt and Security.cipherSeed. These two settings are used by the framework for all of its encryption routines, so it’s obviously better to have values different from the shipped defaults. 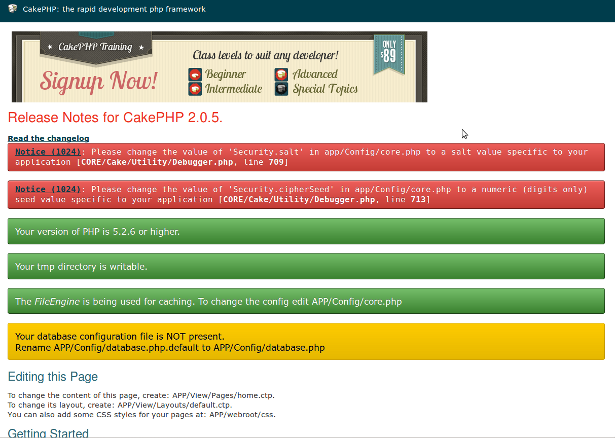 CakePHP uses its Configure class to manage such settings. With these lines, you use Configure‘s write() static method to set the new values. The values will be stored in memory within the configuration object. Another method you’ll use often is Configure::read() to retrieve the application’s settings. The convention of using Section.variableName to name settings is called dot notation and it’s converted internally by CakePHP into an associative array. Now if you reload the page the two red notices disappear. The yellow notice suggests how to proceed to configure database connectivity: rename (or copy) app/Config/database.php.default to app/Config/database.php and open it in your editor. The DATABASE_CONFIG class stores details for all database connections inside its public properties. The starter file provides you with the $default and $test properties (the first is used by default by the application, and the latter is used optionally for PHPUnit tests). Each variable is an associative array of settings that should be familiar to you: hostname, login, password, database, and prefix. The datasource key sets which database driver to use and the default is MySQL (Database/Mysql). 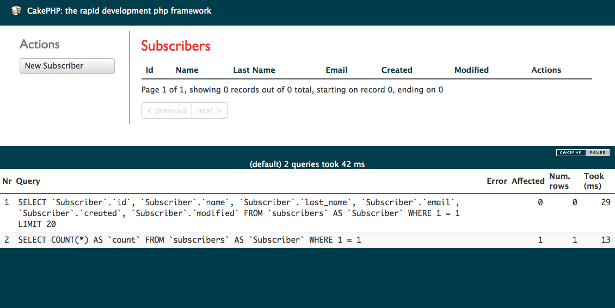 CakePHP uses PDO and so it also supports Postgres, SQLite, and MS SQL Server. Additionally, you can add custom datasources or override existing ones. I’ll continue demonstrating with the default MySQL driver. Looking inside the core.php file you can see other interesting settings that can be overridden with the bootstrap.php file: sessions and logging features, error and exception handling, and more. One useful setting is the debug level. The default value is 2, which means that errors and warnings are displayed, cache is always refreshed, and the full SQL output is shown at the bottom of each page. A value of 1 will suppress the SQL output. A value of 0 is suitable for production; only errors are logged and CakePHP-specific exceptions are displayed gracefully as 404 or 501 errors. Once you have the basic environment set up, you can start coding or… let CakePHP write some code for you! The Bake console tool is very powerful. It can generate any of the basic components (models, views, and controllers) and other useful things like unit tests. Enter 1, and then Bake will ask if you want to specify validation criteria for this model. Enter Y. For each field, Bake asks you to select one or more validation rules and suggests you the most suitable. Chose notempty for the name and last_name fields and email for the email field. If it’s all right, Enter Y and let it work. In less than one minute we have a model class, complete with validation and testing features. Give it a look in your editor. Awesome! If you open the controller file app/Controller/SubscribersController.php you’ll see that it’s almost empty; there is a class definition and a public property named $scaffold. Bake can generate the full code for controllers and can also generate views (and I encourage you to try), but we chose earlier to use the dynamic scaffolding feature. The interface is fully functional! Try to insert and edit some entries; you’ll see error handling in action and full pagination. Now try adding a duplicate address again and this time you should see a more friendly error message. Scaffolding can also be redirected to a specific path, for example /admin. You can build and customize the public pages of an application and use the scaffolding feature for the private administration panel, preferably using one of CakePHP’s authentication, authorization, and security features. I’ll show you the first step and then let you explore the others. If you reopen the subscribers index URL you should see an error, but if you point to http://localhost/Subscribers/admin/subscribers you see your administration panel. In this introductory article, you have seen only the tip of the iceberg of CakePHP’s capabilities. CakePHP has a lot of features and nearly each of them is extensible and customizable to suit your needs. In addition, you can count on a very useful documentation, a complete API reference and an active community called The Bakery. I suggest you to start with the tutorials and… Happy Baking!